Lemon is an inexpensive, easily available citrus fruit, popular for its culinary and medicinal uses. Lemon is generally consumed in the form of lemon juice or lemon water. Lemon water makes a healthy drink, especially when taken in the morning. With its bactericide and antiseptic action, lemon juice activates the white cells and strengthens the body’s immunity. Skin Care. In case of greasy complexions, a mixture of one teaspoon of lemon juice, one of grape juice and one of honey is recommended. Hair Care. Lemon juice is also helpful against dandruff if the scalp’s skin is massaged with it. This way, the blood circulation is intensified and the hair becomes shiny and healthy. Good for stomach. Lemon can help relieve many digestion problems when mixed with hot water. These include nausea, heartburn and parasites. Due to the digestive qualities of lemon juice, symptoms of indigestion such as heartburn, bloating and belching are relieved. By drinking lemon juice regularly, the bowels are aided in eliminating waste more efficiently. Lemon acts as a blood purifier and as a cleansing agent. The intake of lemon juice can cure constipation. It is even known to help relieve hiccups when consumed as a juice. Low in Calories. Lemons are full of numerous health benefiting nutrients. 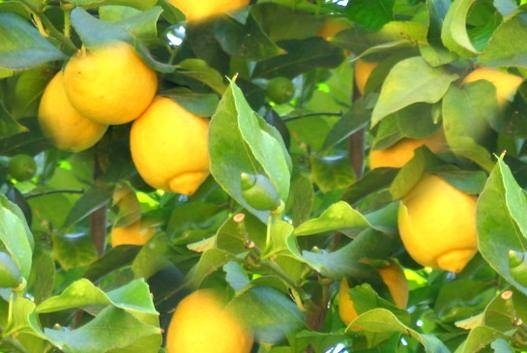 The fruit is low in calories (29 calories per 100 g), one of the lowest among citrus group. Aids Digestion. Its acidic taste is due to citric acid. Citric acid is present up to 8% in its juice. Citric acid is a natural preservative, aids digestion. Studies found that citric acid help dissolve kidney stones. Soluble Natural Anti-Oxidant. Lemons, like other citrus fruits, are excellent source of ascorbic acid (provides about 88% of DRI). Ascorbic acid or vitamin-C is a powerful water soluble natural anti-oxidant. This vitamin is helpful in preventing scurvy. Besides, consumption of foods rich in vitamin-C helps body develop resistance against infectious agents and scavenge harmful, pro-inflammatory free radicals from the blood. Total ORAC value, which measures the anti-oxidant strength of 100 g of fresh lemon juice, is 1225 µmol TE (Trolex equivalents). Inflammatory and Immune System Modulator. Lemons like oranges contain a variety of phytochemicals. Hesperetin and naringenin are flavonoid glycosides commonly found in citrus fruits. Naringenin is found to have a bio-active effect on human health as antioxidant, free radical scavenger, anti-inflammatory, and immune system modulator. This substance has also been shown to reduce oxidant injury to DNA in the cells in-vitro studies. Protect From Lung and Oral Cavity Cancers. They also contain small level of vitamin A, and other flavonoid anti-oxidants such as α and ß-carotenes, beta-cryptoxanthin, zea-xanthin and lutein. These compounds are known to have antioxidant properties. Vitamin A also required for maintaining healthy mucus membranes and skin and is also essential for vision. Consumption of natural fruits rich in flavonoids helps body to protect from lung and oral cavity cancers. Good Source of B-Complex. They also a good source of B-complex vitamins such as pantothenic acid, pyridoxine, and folates. These vitamins are essential in the sense that body requires them from external sources to replenish. Helps Control Heart Rate and Blood Pressure. They contain healthy amount of minerals like iron, copper, potassium, and calcium. Potassium in an important component of cell and body fluids helps control heart rate and blood pressure. Good for Weight Loss. One of the major health benefits of drinking lemon water is that it paves way for losing weight faster, thus acting as a great weight loss remedy. If a person takes lemon juice mixed with lukewarm water and honey, it can reduce the body weight as well. Aids in Dental Care. Lemon water is used in dental care also. If fresh lemon juice is applied on the areas of toothache, it can assist in getting rid of the pain. The massages of lemon juice on gums can stop gum bleeding. It gives relief from bad smell and other problems related to gums. Nutrition Value of Lemon( per 100 gm).